CamerAlert Speed Camera App Recommended by Yahoo! Following last month's news that the Sunday Times chose PocketGPSWorld's CamerAlert, our smartphone Speed Camera App, as the best speed camera app, Yahoo have included CamerAlert in their list "The best apps to make your money go further". 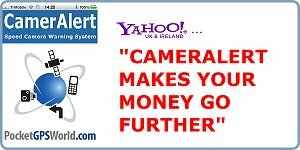 They say that to "Keep car costs down... for 59p CamerAlert warns drivers of upcoming speed cameras with both noise and visual alerts." This, of course, saves you from hefty speeding fines. "Superb app. I've used the PGPSWorld site for a long time to download speed camera locations to a stand-alone TomTom. The database is excellent and updates every week." "Awesome. This app is brilliant. Cheap to buy, free to try and then only a small annual payment gives up to date speed camera info. Interface is great. Cannot recommend this app enough! "The best speed camera database. This is a brilliant app." We're also pleased to report that CamerAlert remains in its regular top 10 slot in the Navigation App charts. CamerAlert is also available for Android phones and has also received excellent reviews. for 59p CamerAlert warns drivers of upcoming speed cameras with both noise and visual alerts." This, of course, saves you from hefty speeding fines. if your already a life time member do you still need to pay the sub or does it recognise you as a lifetime member via your login etc ???? Log in with your details from here and you can use your sub.